Robert Lewandowski scored twice for already-through Bayern Munich to complete its Champions League group campaign with a 2-0 win at Dinamo Zagreb on Wednesday. Halftime substitute Thomas Mueller set up Lewandowski’s opener in the 61st, three minutes before Sebastian Rode played the Poland striker through for his second goal — his seventh in six games. Mueller struck the post with a penalty in the 87th, though it made no difference as Bayern coach Pep Guardiola celebrated his 50th Champions League victory. Already assured of first place in Group F, Bayern was joined in the last 16 by Arsenal, which won 3-0 at Olympiakos to deprive the Greek champion of second place thanks to Olivier Giroud’s hat trick. Bayern, which lost its first Bundesliga game of the season on Saturday, rested Germany goalkeeper Manuel Neuer, while Jerome Boateng, Arturo Vidal, Mueller and Kinsley Coman, who all started on the bench. Franck Ribery made his first start in nine months after recovering from his long-standing ankle problems, while American Julian Green started in his second competitive appearance for the side. Josip Pivaric drew a good save from Sven Ulreich early on. The Bayern reserve keeper also gathered Domagoj Antolic’s effort from the resulting corner. Green’s mistake let Domagoj Antolic play in El Arabi Hilal Soudani, whose shot Ulreich did well to save in the 26th. Xabi Alonso’s 32nd-minute effort was the closest Bayern went in the first half, which ended with Soudani missing an open goal after Ulreich missed a clearance. Mueller and Boateng came on for Ribery and the injured Mehdi Benatia at the break, and Mueller found Lewandowski with a perfect cross from the right for the Poland striker to score with a diving header. Then Rode caught the Dinamo defense out of position and Lewandowski chipped goalkeeper Eduardo for his second. Rafinha made a vital clearance to prevent Soudani from pulling one back before Pivaric hit the crossbar for the home side. Eduardo conceded the penalty for bringing down Vidal, who came on for the uninspired Green. Despite Lewandowski being on a hat trick, Mueller took the penalty and struck his effort against the right post.rs and gave Franck Ribery his first start in nine months, while American Julian Green started in his second competitive appearance for the side. Roma did the bare minimum to advance in the Champions League, qualifying for the Round of 16 following a 0-0 draw with BATE Borisov on Wednesday. While the result stretched Roma’s winless streak in all competitions to five matches, the Giallorossi were fortunate enough to finish second in Group E behind defending champion Barcelona. Barcelona won the group with 14 points following a 1-1 draw with Bayer Leverkusen. Roma and Leverkusen each finished with six points but Roma held the edge with a better head-to-head record. 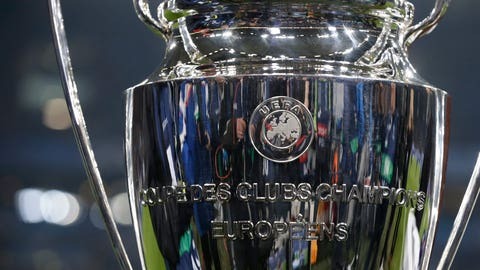 Who’s left to fight for Europe’s grandest club prize? Meet the Champions League teams. Belarusian champion BATE finished last with five points. Roma’s last victory came more than a month ago in a 2-0 derby win over Lazio — a stretch that included an embarrassing 6-1 loss at Barcelona. Roma fans continued their season-long protest over security measures at the stadium, with about 20,000 supporters watching the game. The fans that did turn up whistled Roma off the pitch at the end — even though it was the first time the squad qualified for the knockout stage in five years. Roma dominated from the start but couldn’t quite find the target. After a couple of early chances from Radja Nainggolan, Edin Dzeko had a shot blocked inadvertently by Iturbe. Near the half-hour mark, BATE goalkeeper Sergei Chernik made a diving save on a dangerous free kick from Miralem Pjanic. Early in the second half, Chernik came up with an even tougher save to deny Dzeko with his boot. Seconds later, the BATE goalkeeper deflected wide a close-range effort from Alessandro Florenzi as Roma grew increasingly more frustrated. BATE’s best chance came in the 68th when Mikhail Gordeichuk redirected a cross inside the box and had his shot blocked by Roma goalkeeper Wojciech Szczesny. On a night of missed opportunities, Pjanic had a poor shot cleared off the line by a defender. BATE, which came to Rome a week ago to train for this match, nearly won it with a few late counterattack chances. Valencia was eliminated from the Champions League after a 2-0 home loss to Lyon in new coach Gary Neville’s first game in charge on Wednesday. Maxwel Cornet and Alexandre Lacazette scored a goal in each half to give already-eliminated Lyon its first win in the competition this season and end Valencia’s chances of advancing to the knockout stage. Not even a win would have been enough as Gent defeated Zenit St. Petersburg 2-1 in Belgium to secure second place in Group H and a spot in the round of 16. Zenit won the group with 15 points from six games, five points ahead of Gent. Valencia finished third with six points, good enough for a spot in the Europe League. Lyon was last in the group with four points. Valencia needed a win and hope that Gent lost points against already-qualified Zenit in the other group game. Neville took over Valencia on Sunday, a day after the former Manchester United and England defender watched his new team draw 1-1 with Barcelona in the Spanish league. Valencia got off to a fast start at the Mestalla Stadium, with defender Shkodran Mustafi hitting the post with a header in the eighth minute and having a goal disallowed just minutes later for a foul inside the area. Already eliminated and playing without pressure, Lyon also threatened, forcing Valencia goalkeeper Jaume Domenech to make two great saves early on to keep his team in contention. But there was nothing he could do to stop Cornet’s remarkable shot into the top corner in the 37th, and Lacazette sealed Lyon’s win with a low shot after a counterattack in the 76th. The victory should help ease criticism of Lyon coach Hubert Fournier. In addition to being eliminated from all European competition, his team has taken only one point from its last four French league games. Valencia was trying to become the fourth Spanish team to reach the round of 16, along with defending champion Barcelona, Real Madrid and Atletico Madrid. Sevilla was eliminated on Tuesday. Neville had to deal with a series of injuries that ruled out defenders Antonio Barragan and Lucas Orban, midfielder Andre Gomes, and forwards Sofiane Fegholi and Rodrigo Moreno. To make things worse, Enzo Perez had to be replaced early in the first half, also because of an injury. A goal from Denys Harmash gave Dynamo Kiev a 1-0 win over Maccabi Tel Aviv on Wednesday and a place in the last 16 of the Champions League for the Ukrainian champion. Dynamo’s winner came with a slice of luck when Maccabi’s Tal Ben Chaim diverted a free-kick towards his own goal. Maccabi goalkeeper Predrag Rajkovic managed to stop the ball going into the net, but could only push it into the path of Harmash, who was left with a simple finish. That free-kick followed a foul by Maccabi’s Avraham Rikan on Dynamo’s star winger Andriy Yarmolenko, who had to be substituted with an apparent ankle injury. With Yarmolenko injured and chasing a place in the Champions League last 16 for the first time in 16 years, Dynamo slowed the pace of the game down in a contest which produced few goalscoring chances. Dynamo qualifies in second place behind Chelsea, which beat Porto 2-0 in the other Group G match played Wednesday. The game was played in an empty stadium in the Ukrainian capital Kiev as part of Dynamo’s punishment for racist attacks by its fans in October. Dynamo will also have to hold the home leg of its first knockout round tie behind closed doors.